This short actuality from Edison takes advantage of technology to show off the technological advances of the new century. As with many of the documentary films of the day, it gave an audience a chance to see a spectacle most people would otherwise only have read about or seen in still images. The movie consists of two shots, edited together more or less seamlessly to appear as a single movement. As the movie opens, we see a large pavilion and some other exotic buildings in the background in what is clearly daytime. The camera pans to the left, revealing more structures until it reaches a large tower. Suddenly, the image changes to the same tower lit up brilliantly by night, with floodlights moving across the ground. The camera continues its pan after the edit, showing how buildings that seem to mirror those we saw in the first shot look with their electric lights shining during the night. This movie combines two of Thomas Edison’s inventions – the light bulb and the motion picture – into a single spectacle celebrating the technology of the twentieth century and Edison’s contributions to it. Of course, neither device was really a sole responsibility of the “wizard of Menlo Park,” but the concept of Edison as the inventor of these technologies was part of the branding campaign of the Edison Company. In The Emergence of Cinema, Charles Musser tells us that in order to accomplish the smooth, lengthy pan we see in this movie it was necessary to develop a new mechanism for the tripod. I wonder if it wasn’t also necessary to develop a new film stock in order to pick up the electric lights, since nearly all films were shot in daylight up to this point. Admittedly, it wouldn’t be possible to shoot actors under these lights with the film stock we see here – everything that isn’t a light bulb appears as a pitch black space, except for the areas directly under the floodlights, which are dimly visible. The other interesting piece is the edit from day into night, with the camera in exactly the same position and continuing the movement, giving the illusion that time itself has been manipulated by the filmmakers. This is an early and creative use of editing at a time when most films consisted of a single shot. 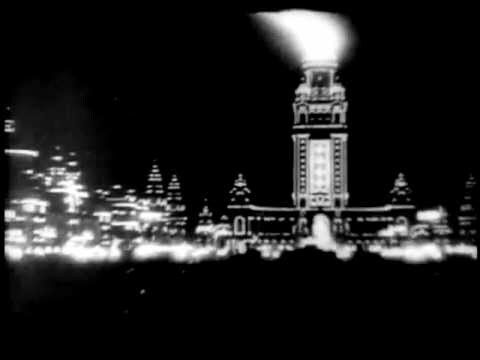 The Pan-American Exposition took place in Buffalo, New York, in 1901, and was the subject of a large number of Edison films. It is the event President William McKinley was attending at the time of his assassination.